The first Boeing 787 Dreamliner has joined the Royal Jordanian fleet, bearing the name of Crown Prince Hussein bin Abdullah II. The assimilation is part of the airline’s strategic plan to modernise its fleet of long-haul aircraft. This year will also see the introduction of other four Dreamliners, an aircraft each month on average. By the end of 2014, there will be five, whereas the remainder of the order will join the fleet during the next few years. He added that the 787s will pave the way for RJ to step into a significant new period, and is a step that pushes the national carrier of Jordan forward in terms of onboard services and route network, enhancing its competitiveness at regional and international levels. According to the company’s long-haul fleet modernisation plan, the Dreamliners will replace the currently operating A340s and A330s. Lozi stressed that the 787 will offer passengers more luxury and comfort on long-range flights, by featuring larger windows and more legroom. “RJ’s preparations to introduce the 787 went smoothly and according to the plan, in constant coordination with Boeing,” he said. RJ will configure its Dreamliner to have 24 business class seats and 246 economy. Customers in all classes will also experience cabin environment improvements such as LED mood lighting, larger windows, bigger overhead bins, lower cabin altitude and enhanced ventilation systems, among other features. 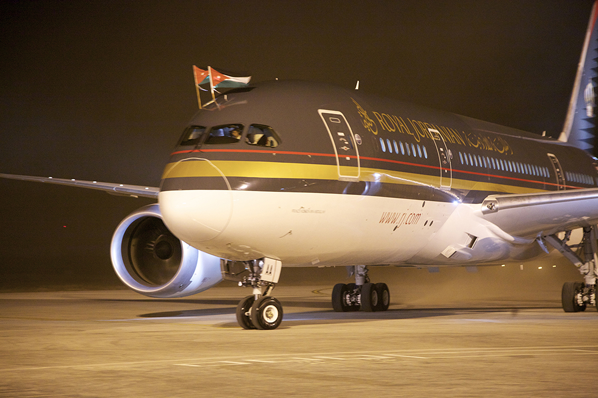 Ray Conner, president and chief executive, Boeing Commercial Airplanes, said: “The Middle East is one of the world’s highest growth areas for commercial aviation and we are proud that Royal Jordanian has selected the 787 to spearhead its fleet modernisation strategy and route expansion plans.